The water quality is one of the poignant issues in many countries. The exploitation of water from groundwater aquifers has become a common practice in different areas of Zanzibar Island. Vulnerability of water to contaminants due to natural and anthropogenic sources is not unusual. Therefore, the primary objective of this manuscript is to study the groundwater quality parameters in the water sources of Northern region of Zanzibar Island. 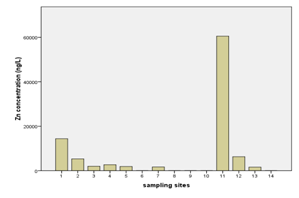 In June 2014, water samples were collected from fourteen wells for bio-chemical analysis. The chemical parameters were analyzed by ICP-OES, while the microbial analysis was done following Bergey’s Manual of Determinative Bacteriology. Some of the analyzed parameters (Co, Be, Cd, Al, Fe and Mn) were not detected. Their concentrations were below detection limit (? DL). The ranges of concentration for other parameters were; Li: ? DL - 0.0433 mgL-1; As: ? DL - 0.0026 mgL-1; Ca: 25.86 - 363.25 mgL-1; Cr (III) : 0.0156 - 0.0382 mgL-1; Mg: 1.784 - 59.82 mgL-1; Na: 13.03 - 166.5 mgL-1; Ni: 0.0008 - 0.0251 mgL-1; Sr: 0.019 - 0.22 mgL-1; Cu: 0.0007 - 0.0072 mgL-1; Pb: ? DL - 0.0054 mgL-1; Se ? DL - 0.0006 mgL-1. Tl: ? DL - 0.0072 mgL-1; V: ? DL - 0.0063 mgL-1; and Zn: ? DL - 0.0605 mgL-1. 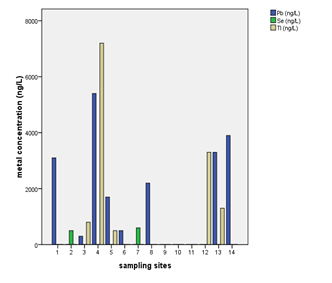 Microbial analysis reveals that some of water samples contained bacterial contamination. Chemical analysis shows that some of the parameters are beyond the WHO or USEPA guidelines. Thus, consumption of water from groundwater sources without awareness of its quality might cause serious ill effects. Therefore, there is a need of attention for the water regulatory agencies and other stakeholders to undertake regular and in-depth assessments of groundwater quality to protect public health. Ground water is the most important source of water for drinking and other purposes in Zanzibar Island, indeed water is an obligatory source of our life, without which its existence would be in doubt. Although groundwater represents an important source of drinking water, its quality is currently threatened by a factors such as water and soil chemistry, geological variation (such as soil type), and anthropogenic activities, which include onsite leaky septic tanks, pit latrines, and all activities conducted around the water sources. All these factors can influence the transportation, distribution, and fate of the chemicals and other contaminants in the groundwater aquifers (Mohamed et al., 2013). Nevertheless, the crisis of ground water quality remains a big concern in many countries of the world. It is estimated that about 1.1 billion people globally use unsafe water for their domestic and other purporses, and the vast majority of diarrhea disease in the world (88%) is attributable to unsafe water, sanitation and hygiene (WHO, 2003). In Zanzibar, Rapid rate of urbanization resulted in an increased demand of water which necessitated for the usage of groundwater to supplement the existing water supply systems, in most areas of the Island. Consequently, the trend of developing privately owned water wells has increased to an amount that has outnumbered the public and community water source. Good water quality management is fundamental for the production of clean water for the human consumption and safety. Both qualitative and quantitative determination of the contaminants and the predictions of their possible source(s) are vital in an attempt of tackling contamination problems in groundwater and surface water. The deterioration of water quality in water body creates a condition so that water cannot be used for intended beneficial uses including bathing, recreation and as a source of raw water supply (Biswas, 2000: Wesley, 2000: Khan et al., 2004). The infiltrations of noxious impurities from various sources such as municipal sewerage, agricultural and domestic effluents are among the key factors, which cause the deterioration portable water quality (Milenkovic, 2005). It is estimated that, over 5 million people die every year due to water-related diseases. Water related diseases kill a child every 8 seconds and are accountable for 80% of all illnesses/deaths in developing countries (UNESCO, 2007). The concentrations of toxic chemicals whether in their organic or inorganic form, and other contaminants have been continuously increasing in various areas of world (Helios-Rybicka, 2002). Human health is ruined directly or indirectly in a number of ways due to environmental degradation. (Guo, 2012). Low recharge rate coupled with over-exploitation of groundwater can result in shaping more pollutants infiltration and rapid deterioration of water quality. Moreover, several other factors might lead to alteration in groundwater composition over the entire world, but most of which have anthropogenic origins (Pan, 2011). Furthermore, it is observed that the polluted water affects the human health, soil nutrients, livestock, biomass and environment in certain areas (Sarala and Ravi, 2012). Biochemical contamination in groundwater might be enhanced by anthropogenic activities, such as improper disposal of used electronic devices (e-wastes), tires, and other waste materials. In addition, the application of fertilizers, pesticides, and metal-containing paints play a significant contribution in the perspective of groundwater pollution. These activities enhance the changes in groundwater composition and thus deteriorating the quality of groundwater aquifers. As an example, lead (Pb) is among the chemical parameter assessed in this study. This element is in category of ‘heavy metals’, it is stable and persistent in the context of environmental contaminants. In general, lead (Pb) is toxic for human health, and at higher levels, it can cause ill effects such as, vomiting, loss of appetite, anemia, intestinal colic, headaches, double vision, mental disturbance, anxiety, convulsions, coma, muscular weakness, loss of memory, and damage of brain, liver and kidney (Bellinger, 2008). The presence of other cations in the study area could be of detrimental effects in human welfare if they are beyond the recommended guidelines. Therefore, the assessment of groundwater quality is vital, and its consequences can be connected with non-communicable diseases such as cancer. Thus, the aim of this study is to evaluate the levels of the selected biochemical parameters in the ground water wells of Zanzibar Northern region in an attempt of assessing its suitability for human consumption as regard to WHO or USEPA standards. 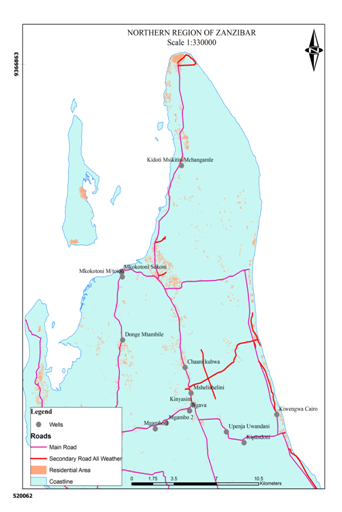 In June 2014, samples of water from underground water sources were collected from fourteen locations of Zanzibar Northern region. 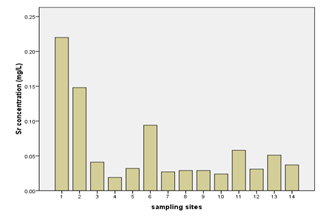 Water samples were collected in sterile bottles (1500 mL) from 14 stations (Fig. 1) were preserved, and analyzed by using standard methods for the examination of water and wastewater (APHA, 2005). Before water sampling, all the glass bottles were cleaned and rinsed thoroughly with water to be analyzed. All reagents used were of analytical grade. Samples for the analysis of chemical parameters were filtered using disposable Merck 0.45µm filter Millipore. Thus, the concentrations obtained correspond to the dissolved concentration in the respective ground water sites. The ground water samples were stored at 1- 4°C temperature prior to biochemical analysis in the laboratory. Metal analyzed include Co, Be, Cd, Al, Fe, Mn, As, Ca, Cr (III), Mg, Na, Ni, Sr, Cu, Pb, Tl, V, and Zn. The concentrations of these metals were determined using ICP-OES (Thermo Scientific iCAP 6000). Grab sampling procedure was adopted as recommended by Standard Method for microbiological analysis. The occurrence of bacteria on respective selective or differential media was observed on the basis of their colonial, morphological and biochemical properties (Table 4) following Bergey’s Manual of Determinative Bacteriology, 1994. Table 3, shows the data for minimum and maximum levels of chemical are parameters. Table 4 depicts the bacteriological parameters in which 29 percent of the analyzed water were found to contain bacterial colonies. The comparison of the analyzed chemical parameters has been made with prescribed W.H.O. and or US EPA standards (Table 2). This comparison highlights the degree contamination for each of the water source within the study area. Water sample from well at Kiwengwa Cairo had highest levels of thallium, lead, nickel and magnesium (Annex-1,Table-3; Fig. 2 & 3). This water source is at the seashore (Fig. 1); hence, the elevated levels of these parameters might be contributed by salt intrusions, which bring in some contaminants from the sea into the aquifer of the well at Kiwengwa Kairo. Moreover, geological and hydrological conditions of this site could also be potential factors the transport and fate of the analyzed parameters. However, the highest concentrations of selenium and chromium (III) were detected from Kidoti msikitini area. Similar reasoning as for the Kiwengwa Cairo is also applicable to water source at Kidoti msikitini area (Fig. 1, 2, & 3). Magnesium usually occurs in smaller concentration than calcium because the dissolution of magnesium rich minerals is a slow process, thus calcium is more abundant in the earth’s crust. The magnesium may also be derived from dissolution of magnesium calcite, gypsum and dolomite from source rocks (Sarala and Ravi, 2012). Recent study on groundwater quality for water sources located at Urban West Region of Zanzibar, revealed the occurrence of lead, magnesium and thallium and other parameters in some groundwater sources (Mohamed et al., 2014a, Mohamed et al., 2014b). 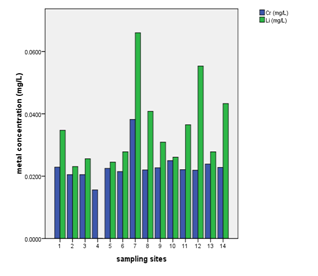 The percent occurrence of Se, Cr III, Pb, Mg, and Tl in water samples were 14%, 100%, 50%, 100%, and 36% respectively (Table 2). Magnesium showed strong correlation with thallium as well as with nickel with Pearson correlation of 0.839 and 0.919 respectively (Annex-2). The highest levels of arsenic, zinc, and vanadium were observed from the water well at Mkokotoni sokoni area ((Annex-1, Table-3, Fig. 4, & 5). The effect of salt intrusions is anticipitated to have a significant contribution on the occurrence and the levels of these parameters. Other reasons as noted above are applicable. Because these areas are located near the seashore, some common features or trends are apparent to be witnessed. 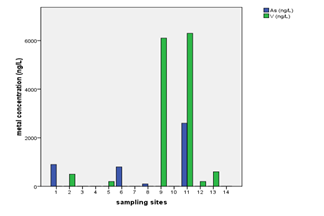 The percent occurrence of As, Zn, and V in water samples were 29%, 64%, and 43% respectively (Table 3). Arsenic showed strong correlation with zinc with Pearson correlation of 0.932 (Annex-2). The concentrations of nickel, calcium, and strontium in this study were highest at Donge mtambile (Annex-1, Table-3; Fig. 6, 7, & 8). Copper and lithium were present at highest levels at Mshelishelini and Upenja-uwandani areas respectively ((Annex-1, Table-3; Fig. 5& 6). Processes such as cation exchange carbonate mineral dissolution, and oxidation of organic matter might be the controlling factors for the occurrence of cations and other parameters in a given environment (Vandenbohede and Lebbe, 2012). In this study, the geology of the sampling site is expected to be of sound reason for the occurrence of the parameters at elevated levels. Netherthelss, the presence of these parameters could a consequence of anthropogenic activities. 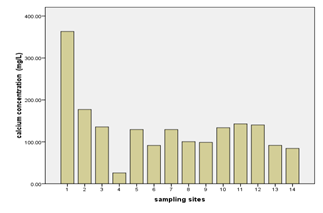 The percent occurrence of Ni, Ca, Sr, Li, and Cu in water samples were; 100%, 100%, 100%, 93%, and 100% respectively (Table 3). Strontium showed strong correlation with Nickel as well as with Thallium with Pearson correlation of 0.995 and 0.729 respectively (Annex-2). 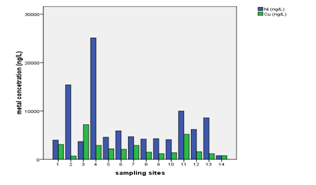 Generally, at least each of the sampling sites contains traces of one or more of the analyzed parameters. Majority of the parameters were well below the WHO or other recognized organizations. The ratio of levels of lithium to nickel for almost all the analyzed samples was greater than a unit (Annex-1). Some of analyzed parameters are not yet in the list of WHO guidelines for safe drinking water, however, they presence and level in water sources may be of detrimental effect for the consumers. In this regard, it is critical to take the precautionary measures and to establish good and sustainable water-management program. In the case of bacteriological analysis, further analysis is needed to reveal the exact species identity of the observed bacterial colonies. The authors of this paper would like to express many thanks to His Majesty’s Government of Brunei Darussalam for funding this project.We also thank Hjh Faridah, Azzlin, Najib, and other UBD chemistry laboratory staffs for their valuable assistance. Table 2: Water quality parameters and WHO, USEPA Standards. Table-3: Minimum and maximum concentrated of the analyzed parameters. Figure-2: Levels of Se, Pb and Tl in water samples. APHA, (2005). ?Standard methods for the examination of water and waste water?, 21st edition, American Public Health Association, Washington, DC., USA. Bellinger, D.C. (2008). Lead neurotoxicity and socioeconomic status: Conceptual and analytical issues. Neurotoxicology. 29(5):828-32. .
Biswas, S.P. and Boruah, S. (2000). Ecology of the river Dolphin (Platanista Gangetica ) in the upper Brahmaputra. Hydrbiologia, 430, pp 97-101. Guo, G., Wu, F., Xie, F., and Zhang, R. (2012). ?Spatial distribution and pollution assessment of heavy metals in urban soils from southwest China,?Journal of Environmental Sciences, 24, 410?418. Helios-Rybicka, E. (2002). ?Distribution of pollutants in the Odra river system. Part I. General description of the International Odra Project (IOP),?Polish Journal of Environmental Studies,11, 649-654. Khan, N.; Mathur, A. and Mathur, R. (2004). A study on drinking water quality in Laskhar (Gwalior). Indian J. Env. Prot., 25(3), 222-224. Milenkovic, N., Damjanovic, M., and Ristic, M. (2005). ?Study of heavy metal pollution in sediments from the iron gate (danuae river), serbia and montenegro,? Polish Journal of Environmental Studies, 14, 781-787. Mohamed, A. A J., Ibrahim, A., Sadri A.S., Lee H. L., and Islam, S. M. (2013). Levels of Hexavalent Chromium, Copper, and Total Hardness in Springs and Underground Water in Zanzibar Island. Asian Journal of Applied Sciences, 1, (05), 212-219. Mohamed, A. A. J., AbdulRahman, I. andLim, L. H. (2014a). Groundwater quality assessment in the urban-west region of Zanzibar Island. Environ Monit. Assess, 186, 6287?6300. Mohamed, A. A. J., AbdulRahman, I., Said, S.A. and Lim, L. H. (2014b). Occurrence of Arsenic, Lead, Thallium and Beryllium in Groundwater. American Journal of Environmental Science 10, 164-170. Pan, Y., Gong, H., Zhou, D., Li, X., Nakagoshi. (2011). ?Impact of land use change on groundwater recharge in Guishui River Basin, China,?Chinese Geographical Science, 21, 734-743. Sarala, C., Ravi, B. P. (2012). Assessment of Groundwater Quality Parameters in and around Jawaharnagar, Hyderabad. International Journal of Scientific and Research Publications, 2, (10), 1-6. UNESCO. UNESCO (2007). Water Portal newsletter. No. 161: Water-related Diseases. www.unesco.org/water/news/newsletter/161.shtml (accessed 25.12.2015). Vandenbohede, A., Lebbe, L. (2012). Groundwater chemistry patterns in the phreatic aquifer of the central Belgian coastal plain. Applied Geochemistry, 27: 22?36. Wesley, G. S. (2000). Bio accumulation of heavy metals by industrial mollusks of Kanyakumari water. Poll. Res., 23(1), 37-40.
WHO, (2003). Quantifying selected major risks to health. The World Health Report 2002. World Health Organization, Geneva.